Imagine my thrill a few years ago when I discovered I could make my own. Admittedly, nothing I've managed to brew in my kitchen has matched the glory in that $21 bottle of Grand Marnier, but I've done some pretty good stuff. And these are the kinds of recipes that are honestly easy, if a little time-consuming. Lightly fill a quart jar (I never do more than a quart my first time out on any recipe; the size of the jar really isn't important; I save big applesauce jars all year for this purpose) with the herbs and/or fruit of your choice. Don't pack it down, just kind of fill it. Put a lid on the jar and let sit in a cool dark place for about 2 weeks; shake every day or so. Mix together equal parts infused alcohol and sugar syrup and pour into old wine or liqueur bottles you didn't throw out. Label the bottle with contents and date. Let mellow for about two months in a cool dark place. Honestly, the fridge does just fine for me. At this point, it's pretty much ready. If you are just drinking it yourself, you don't have to do anything else--just pour and enjoy. To give as gifts, pour into pretty bottles (either saved ones or new ones--I buy mine from Specialty Bottle, because you can get smaller-than-case amounts.) and make pretty labels. Not bad, huh? Pretty easy! If you are using citrus peel, make sure you only use the zest--don't let any of the white pith get into the alcohol, or it will be bitter. Use organic fruits, especially citrus fruits! Remember that you are extracting the alkaloids from the plant material, and if there's pesticide residue you're extracting that too, in higher concentration! For a fruit liqueur, instead of using half grain alcohol and half water, try substituting fruit juice for some of the water for even more flavor. If you are using herbs, and you want your liqueur to be pretty when you're done, you may want to lay a layer of plastic wrap over the top of your alcohol in the jar--any leaves that float to the top will oxidize and turn brown, which won't affect the flavor of the final product, just the color. Fresh mint leaves with 5-6 oranges worth of zest and juice. Almost any fresh (or frozen!) berry mixture--try raspberry, blueberry, blackberry...have fun. Again, I always recommend the google search (Check out Gunther Anderson's site--dozens of recipes there!) --there are lots of recipes out there. If you try these in smaller quantities, keep really good track of what you put in there, so you can recreate it later if you love it. 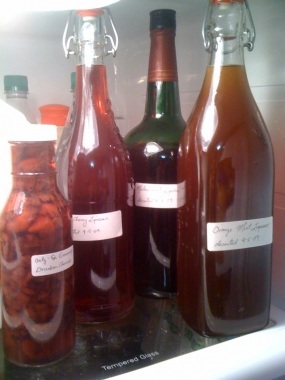 I've done a couple of other posts on this--one last summer with fruit and herbs and stuff, one with my adventures with cherries, and another where I found a recipe for homemade Irish Cream Liqueur. Have fun! And, as always, infuse responsibly! Another good site with recipes is this one on Danish Schnapps. Some of those combinations sound down right heavenly! A split vanilla bean thrown in with berries and/or cherries can be quite yummy too. Very tempting! Now I just have to decide what to make :) Thank you!